The Maldives is a low-lying country that is expected to be among the first in the world to go under water as a result of climate change. While it may take a few more decades for rising sea levels to wreak havoc on the archipelago, there are more immediate and pressing problems tearing the country apart. An Indian Ocean archipelago of 1,192 islands, the Maldives is a tourist paradise. Tourism is the backbone of the country’s economy, and tour operators have reported hundreds of daily cancellations since the state of emergency was imposed on February 5. Following the state of emergency, Maldives has been in a tensed state of existence in as the archipelago is facing a sort of turmoil, ransacking its tourism based economy. The current crisis was the result of a Supreme Court ruling on February 1, overturning the convictions of Yameen’s rivals. In addition to ordering the government to release the nine convicted opposition leaders, the apex court called for reinstating 12 parliamentarians who were stripped of their seats last year when they left Yameen’s Progressive Party of Maldives to join the opposition. Two weeks after the government of the Maldives declared a state of emergency amid rising political tension, on February 20th Parliament approved a 30-day extension that, among other grave consequences, may result in serious damages to the economy, scaring away international visitors. On February 20, President Abdulla Yameen Abdul Gayoom requested to extend the Maldives state of emergency for a total of 45 days. The Maldives government and the Ministry of Tourism have emphasized their commitment to safety for civilians and tourists alike. The emergency “shall only apply to those alleged to have carried out illegal activities — it shall not apply to otherwise law-abiding residents of, or visitors to, the Maldives,” Yameen’s office said in a statement. 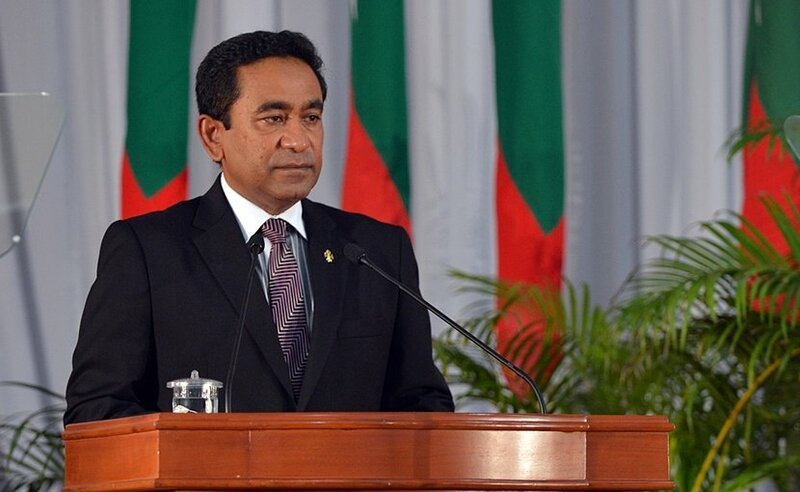 Since Yameen became president in a controversial election in 2013, he has systematically crushed dissidence within his party and removed rivals from the political arena. Maldives’ Mohammed Nasheed. Official White House Photo by Lawrence Jackson, Wikipedia Commons. For instance, MDP leader and former Maldivian president Mohamed Nasheed, the archipelago’s first democratically elected leader, was convicted on terrorism charges in 2015 and sentenced to 13 years in jail. While Nasheed has been living in self-exile in Britain since 2016, several other opposition leaders, including a former defense minister in the Nasheed government, Mohamed Nazim; Yameen’s once “trusted” vice-president, Ahmed Adheeb; and leader of the opposition Adhaalath Party, Sheikh Imran Abdulla, are in jail on long prison terms. The opposition Maldivian Democratic Party (MDP) calls on neighboring India to militarily intervene to end the crisis, and let Nasheed become the president. According to reports in the Indian media, the government has ruled out the military option for now, although it has activated its standing operating procedure for the Maldives by keeping troops ready for deployment there at short notice, should the need arise. But India is said to be working with a group of countries, including the USA and Saudi Arabia, to pressure the government through imposition of sanctions. However, India has traditionally opposed the sanctions option to influence regime behavior, as sanctions affects ordinary people rather than the ruling elite. Relations between India and the Maldives have been strong for decades; India played a major role in building the Maldives’ economy and military. It was India’s support that kept the authoritarian Gayoom in power for three decades. However, bilateral ties have been fraying since Nasheed’s exit from power in 2012. That year, the Maldivian government abruptly terminated a $500 million contract awarded to India’s GMR Infrastructure for developing an airport in Male. Bilateral ties have deteriorated since then. Yameen’s “authoritarian governance” has irked India, but it is his tight embrace of China that has raised hackles in Delhi. A country could decide to send military forces to neighboring or any other country only on the request from the nation concerned. Otherwise the intervention becomes totally illegal and amounts to invasion. USA led NATO have been occupying many countries in Middle East and Afghanistan after invading them on false justifications. Anyone who closely follows Indian state behavior abroad would quickly endorse the argument that India would not intervene in Maldives citing any reason. In order to decide to sent troops to nearby Maldives, India must have got a request from the government of Maldives but that government has not sought it. In 1988 when India intervened in Maldives it was on the request received from the then President Gayoom. When an external government is engaged in dealing with an emergency situation, naturally that power should be given huge service charges. Without any request from Maldivian government of Yameen, India won’t get any service charges. 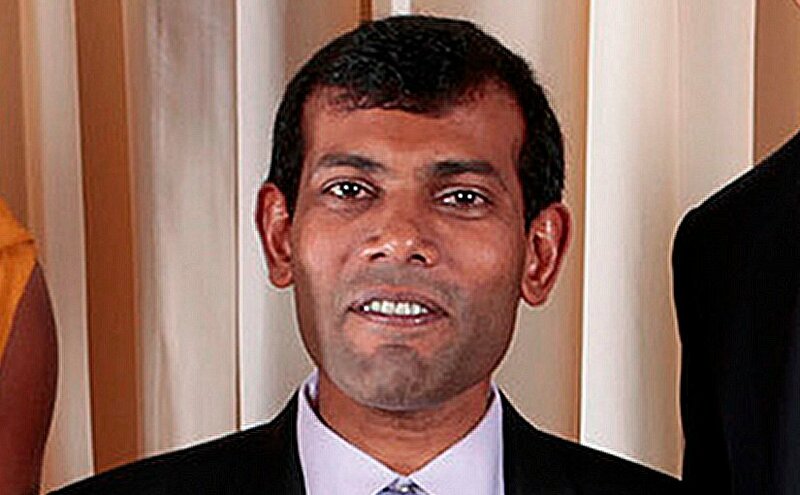 Though the exiled opposition leader Nasheed might be willing to pay the money to India as he has made the request to New Delhi, but India cannot respond to non-government actors. This step alone can easily do away with any suggestion to India for intervention in Maldives. The government of Maldives has not asked for Indian military to help bring peace and normalcy back to the island nation. India cannot attack Maldives on the suggestion by the opposition leader who now lives in Sri Lanka. Claiming to be a ‘terror victim’, India would not like to be seen as an aggressor as no amount of justification can make New Delhi “innocent” although it has got that look. . But there are some more important reasons that deny India any chance to send troops to Maldives which, in the absence of a request from the government, would mean to remove the President and government from power. Today, archipelago Maldives is not alone, though insignificant for non-tourists. China is fast becoming an economic ally of Maldives and might soon have its own military bases in the island nations as well. The Chinese nexus is the prime strength Maldives would operate on. Unlike China, USA can only bully small nations but cannot spend money on them, does not invest there to help their economies flourish. Already, Beijing, knowing the Indian strategic community’s desire for a military showcase by India in Maldives, has expressed its opposition to outside intervention from India. Unlike USA, the India cannot attack Maldives on the suggestion of USA or Israel or Opposition leader Nasheed and if that at all happens India would possibly be in a long term trouble. In 2014, when Chinese President Xi Jinping visited Maldives, Yameen handed over the airport project to a state-run Chinese company. The two sides signed a string of deals during that visit that saw Beijing participate in a big way in infrastructure building in Maldives. Maldives also became an enthusiastic participant in the Maritime Belt of China’s Belt and Road Initiative. Then in December last year, the Maldives and China signed a Free Trade Agreement, much to India’s concern. Delhi is worried about Beijing’s mounting influence over Maldives and the strategic implications for India. China’s growing presence in the Maldives is a serious concern to India given the latter’s geographic proximity to the Indian coastline. 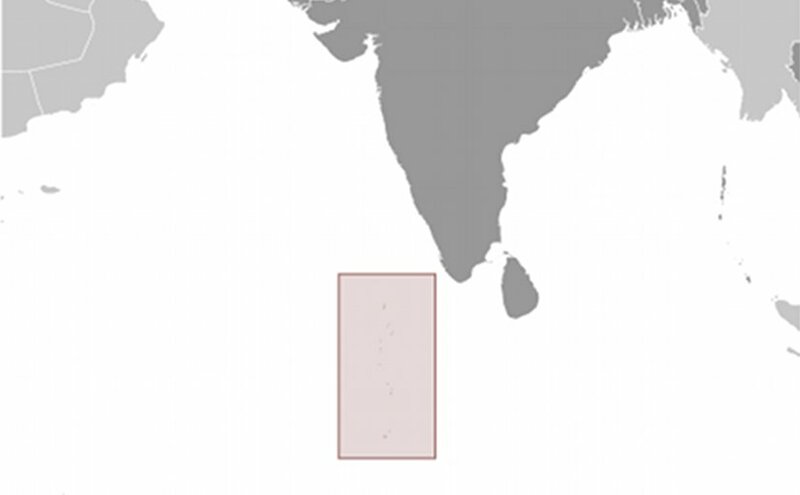 The Maldives also sit near international sea lanes through which India’s oil imports traverse. India’s security would be threatened should the Chinese set up a naval base in the Maldives. These concerns are not without substance; in August 2017, three Chinese naval vessels docked at the Maldives’ capital, Male, setting off alarm bells in Delhi. India is watching the unfolding crisis in the Maldives with concern. It is mulling different options. Not doing anything is not an option given India’s stakes in a stable Maldives. A seemingly busy India, whose PM is on a perpetual foreign tours as India’s foreign policy with very little time for the people and keeps mum on all major anti-people events, promotes rampant corruption and the powerful lords loot the nation and its resources for private use, steel cash from nationalized banks, illegal mining and land grabbing. IPL Modi, PNB looter Nirav Modi- both have escaped from India and are now abroad thanks to timely help and aid from agencies of Indian regime, Kothari, et al are just the tip of iceberg in Indian saga of misappropriation of state resources while the intelligence and media lords are terribly busy blasting fake news about Pakistan and Muslims in order rot keep the fanatic sections of India. The Indian government has said it is “disturbed” by the declaration of emergency in the Maldives and “the suspension of the Maldivian people’s constitutional rights.” It is “carefully monitoring the situation,” it said. Earlier, its Ministry of External Affairs issued a travel advisory to its citizens traveling to Maldives. Sections in India are in favor of an Indian military intervention in the Maldives. Some argue that it does not behoove a rising power with big ambitions like India to shrink away from acting robustly to defend its interests in the region. A section of the BJP leadership has described the current crisis in the Maldives as an “opportunity” for India “to stake its claim to being a global player.” It is “imperative” for India to intervene in the Maldives, they argue, “since any global role is always dependent on a country’s performance in the neighborhood first. Those who want to see India a superpower as soon as possible with a magic touch, say that “time is ripe for a decisive Indian intervention in the Maldives.” Such intervention by India would have the support of countries like the USA, Israel and UK, which, they reason, would be keen to see the pro-China Yameen removed from power. “This could be used to silence the Kashmiris who fancy for sovereignty”. If India does decide in favor of military intervention, this will not be the first time it has done so in the Maldives. In 1988, India sent in a small contingent of troops to avert a coup attempt against Gayoom. But the circumstances of that intervention were different from what exists today. In 1988, President Gayoom invited India to intervene. Yameen is unlikely to do so now. Importantly as well, 30 years ago the coup plotters were just a small group of mercenaries. A military intervention today could leave Indian troops stuck in a Maldivian quagmire. Maldives’ Abdulla Yameen. Photo Credit: Maldives Government. Yameen, like most rulers today, is determined to cling to power. Not only has Yameen ignored the court order, but he went on to declare an emergency and had the judges who handed out the ruling arrested. Reinstating the 12 parliamentarians would reduce his government to a minority. That would enable parliament to oust him in a no-confidence vote. Besides, Yameen seems apprehensive that allowing Nasheed to return to the Maldives and freeing the other opposition leaders would galvanize the opposition and boost mass protests against his iron-fisted rule. Presidential elections are due later this year and Yameen fears that he will be defeated by a strong opposition campaign. With the proclamation of a state of emergency, Yameen has prevented parliament from meeting. The emergency will be in place for 15 days, during which he can be expected to pack the judiciary with loyal judges. He is likely to engineer defections from the opposition. He could extend the state of emergency as well. Yameen has already appointed new judges, who have since annulled the court order releasing the opposition politicians. Former president and opposition leader Maumoon Abdul Gayoom, who is Yameen’s half-brother, has been detained and Yameen has fired two police chiefs over three days. With Yameen tightening his grip, Nasheed has called on India “to send an envoy, backed by its military to free the judges and the political detainees.” He has asked for India’s “physical presence” in the Maldives. China has warned India against any military intervention in Maldives. China is closely watching events in the Maldives. The archipelago is a popular destination for Chinese tourists; in light of the current uncertainty, Beijing has advised its citizens to postpone travel to the Maldives. Having invested heavily in the Maldives, China is concerned about the safety of its investments, projects, and personnel. It has asked the Maldivian government to take necessary measures to earnestly protect the security of the Chinese enterprises, situations and personnel. 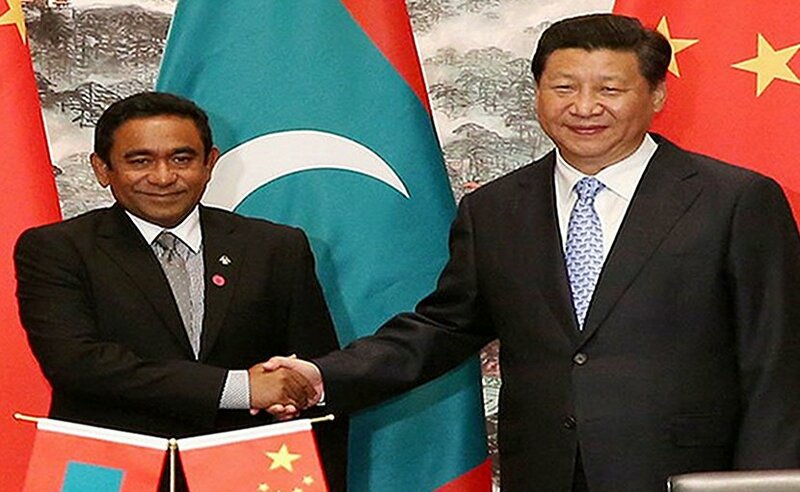 Unlike India, China has leverage with the Maldivian government. Yameen is likely to listen to China. Beijing would not want to see Yameen go. China is opposed to India meddling in Maldives and has made this more than clear. An editorial in China’s state-run Global Times chided India for openly intervening in its neighbors’ domestic affairs. It observed that there is no justification for India to intervene in Male’s affairs. Any military showcase by India could also prove counterproductive to India’s long-term interests. It would push Yameen closer to the Chinese, for instance. Besides, it would boost perception of India as a “big brother” and a “bully” in the region. Undemocratic forces in India’s neighboring countries have usually stoked anti-India sentiment among the masses by stressing such perceptions. This can be expected to happen in the Maldives too. Importantly, an Indian military intervention is unlikely to benefit democratic forces in the Maldives in the long run as a democratic government, should one come to power in the archipelago following an intervention, would be seen as “made in India” with the USA acting as a “midwife.” Such a government would lack legitimacy in the eyes of many Maldivian people. It does seem that the Sino-Indian contest for influence in the archipelago is as fierce as the ongoing tussle between Yameen and the Maldivian opposition. Thus any suggestion for Indian military intervention in Maldives is ruled out. India could perhaps act as a mediator in a possible dialogue between Yameen’s Maldivian government and the opposition. But Yameen would not welcome an Indian role against the Chinese wish. India thus cannot have privileged the leverage to influence the decisions of Maldivian President. Moreover, he has reportedly defied Indian requests relating to the current crisis.